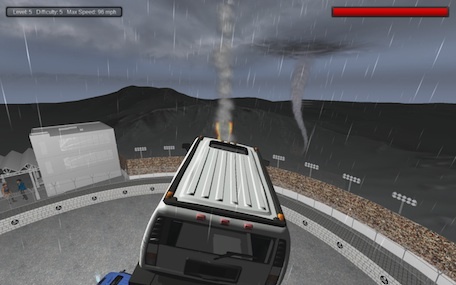 Crash-n-Smash your way to victory in this fast paced realistic multiplayer online demolition derby winner take all motor sport contest to the death! Supports Xbox 360, Logitech, and many more gamepad controllers as well as touchpad, mouse, and keypad controls. Plays great on MacBook Pro too! Multiplayer Online with No Subscription Fees • Real audio sounds • Vehicle explosions • 5 extreme levels of play • Autoplay demolition derby mode • Sophisticated artificial intelligence • Fully functional rear-view mirror • Forward and reverse directions • Real-world physics action • Multiple camera positions • Quadratic steering assist • 5 levels of difficulty • And more! For single-player games there are 5 levels of game play with each level getting progressively harder. For multi-player games their are 5 degrees difficulty with each degree getting progressively harder. You must first disable all of your opponents vehicles by hitting them in their radiators multiple times until their vehicle no longer moves, but be careful not to damage you own radiator! Hint: Hit their radiator with the front corners of your vehicle or back into their radiator while driving in reverse. Once disabled, you then have to hit their gas tanks from behind to blow them sky-high! 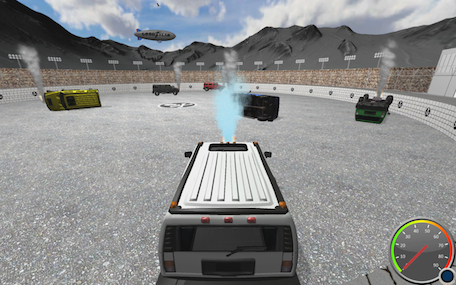 For single-player mode you need to do this at each level to all opponent vehicles before your vehicle is disabled in order to advance and win the game. Use Arrows, Mouse, Touchpad, Gamepad, or WASD Keys to Steer and Accelerate. Press 'M' to toggle Menu, 'C' to change Camera position, 'R' to toggle Rearview mirror, 'T' to toggle Speedometer, 'I' to toggle Information, 'N' for Next, 'B' for Repeat. Press 'M' to toggle Menu, 'C' to change Camera position, 'R' to toggle Rearview mirror, 'T' to toggle Speedometer, 'I' to toggle Information, 'L' for Lobby. Although our game app works with many controllers, to enable additional gamepad controls you can install a Joy Stick Mapping Software like Joystick Mapper for Macs. We find they work very well, this one in particular has been extensively tested with our game apps and found to function perfectly for mapping buttons to toggle the Level Menu, Rearview Mirror, Speedometer, Information Bar, and click the Next and Repeat buttons as well - a great convenience.